3D bioprinters are able to print living tissues for medical transplants and testing to name a few. However, recreating human tissues require a combination of human cells, biogels as well as different types of bioink materials aside from the nutrients and oxygen needed by the cells to survive. Specialized 3D bioprinters do not come cheap and they can cost between $100,000 and a million dollars depending on their specifications. 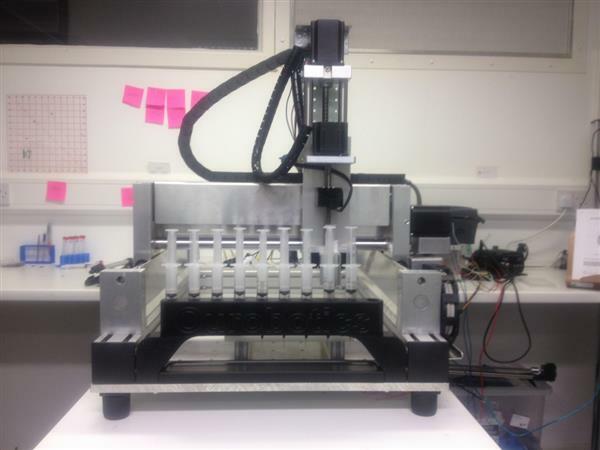 With the aim of developing an affordable 3D bioprinter, inventors Jemma Redmond and Stephen Gray combined their expertise on nano-bioscience and biochemistry to create an innovative bioprinter. The result of their hard work is the Ourobotics Revolution 3D bioprinter which is a low-cost device that can print using 10 materials in the same device. The printer also has a heated enclosure to provide ambient temperature to the growing tissue. To date, no 3D bioprinter has the ability to print 10 materials in a single bioprinted structure. However, the inventors of this bioprinter said that they can add more materials in the future. What makes the bioprinter astounding is that it can retool itself; thus it can be used from laser and UV projectors to 3D printers. It can also handle different materials like gelatin, collagen, chitosan and alginates to name a few. With the features of this new 3D bioprinter, you can build complicated tissues, create custom pills or combine inorganic and organic materials. This 3D printer will no longer be limited to creating prosthetics, customized medical tools as well as medical models as it can be used to print live tissues for transplant.